Last week, rumours began swirling around Beijing about possible factional infighting within the Chinese Government involving President Xi Jinping and Premier Li Keqiang. Online reports last Friday night [13 July 2018] claimed that gunfire lasting some forty minutes had been heard in the vicinity of the south-east Second Ring Road of Beijing [outside Zuo’an Men]. 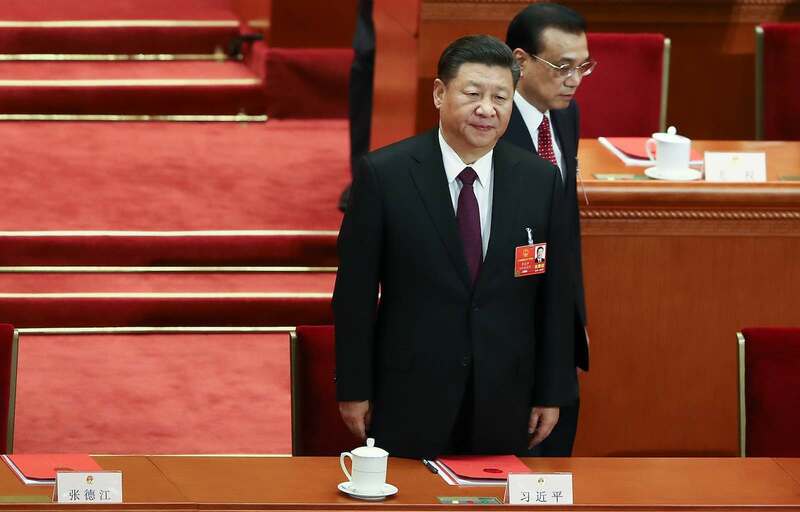 It was claimed that anti–Xi Jinping groups had forged a consensus to overthrow the Chairman and that dramatic events were about to unfold in the Chinese capital. Sounds to me like a different version of the ‘China Fantasy’, rooted in the search for the mythical Chinese Gorbachev. [G]iven that elite politics are more opaque than they have been in years, it is certainly possible something strange is going on. The compound that houses the headquarters of the Chinese Communist Party and the State Council – a walled-off part of central Beijing – looks to be on a war footing. The irregular signals that have come out of the former imperial garden, known as Zhongnanhai, over the past few weeks hint that tensions are mounting behind the bamboo curtain. For the past six years, since Xi came to power, Zhongnanhai has been ruled from the southern side of the premises, the home to party headquarters, where Xi has his office. The north side, where Li’s State Council is based, has been the weaker flank. We are less than a month away from the expected Beidaihe meetings and as always in advance of that mysterious conclave the rumours begin to fly in July. The political mood in China shifted on July 4, when a young woman live-streamed herself splashing ink on a Xi poster to protest the ‘tyranny’ and ‘brain control’ imposed by his government. The video quickly went viral. She went missing after tweeting a photo of uniformed men outside her door, and is believed to have been detained … The incident opened the floodgates for further condemnation of Xi. Just as citizens were getting frustrated with Xi, a scandal broke. In Jilin province, 250,000 rabies vaccines were found to be defective. [T]here must be a clear explanation to every citizen of the nation. After attracting more than 400,000 likes and 100,000 shares on Weibo, Li then took a higher profile on state media. The truth must be found as soon as possible, Li said, vowing severe punishment and zero tolerance toward whichever enterprise and whoever involved. The premier pledged to crackdown hard on illicit and criminal activities that compromise people’s health and safety, harshly punish offenders, and resolutely hold people who neglect their supervisory duties accountable to give the people a safe and trustworthy living environment. Despite a more visible Li Keqiang, Xi Jinping was still on the front pages of the People’s Daily. However, the language about Xi was bureaucratic and focused on his state visits to the Middle East and Africa. Xi Jinping appreciates President Cyril Ramaphosa’s success in pushing forward with Sino-South African relations and promoting development in bilateral relations. Xi Jinping pointed out that China and South Africa are both inherently important medium-to-large countries and emerging markets. Based on Xi Jinping’s instructions and Li Keqiang’s demands, the State Council has implemented a specialised working mechanism and sent an investigative team to be stationed in the Changchun Changsheng Biotechnology Company to conduct an investigation. With Xi in Africa and Li in Beijing, the northern side of Zhongnanhai may be trying to wrangle back some of the power it lost from the southern side. In other words, the State Council and Li Keqiang could be taking a more prominent role with Xi Jinping and party headquarters under pressure. [T]he Xi administration appears to be on solid ground. He left for a 10-day trip to Africa on Thursday, and it is unusual for a Chinese leader to leave the country in times of instability. Given that Xi did leave Beijing for the Middle East and Africa, there may not be as much social discord or state-party fighting in China as has been suggested. However, it certainly looks as if Li is regaining some of the relevance and credibility he lost in recent years. Li is not gaining power while Xi is losing power, rather Xi remains powerful and Li is trying to gain some power at the same time. * This reference was amended following publication to clarify the source of the Weibo page.